A small chapel for this outlying part of the parish of Ticehurst was opened in 1838 (VCH 9 p257), designed by L Vulliamy (B 29 p142). A photograph of 1903 by Francis Frith depicts a small white gabled church with lancets and a shallow ‘west’ porch. This is said to have been refaced in brick to become the chancel of the present church (Elleray (1981) p81), but the photograph shows that the old church stood at right-angles to the road and almost on it, whereas the present one is set back and is parallel with the road, so their positions were quite different. The present church, which is by G E S Streatfeild (BE(E) p629), has varying combinations of lancets, but this is really all it has in common with the work of 1838. The walls are brick with stone dressings and there is a low aisle, which is slight, particularly inside. 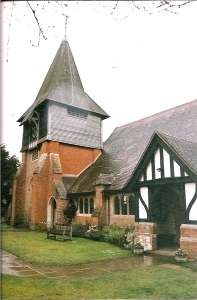 The lower stage of the disproportionately broad tower, east of a big half-timbered porch, is conventionally gothic, but the horizontal bell-louvres on the boarded upper one, especially in the use of vernacular materials, are a sign of the early C20. The side of the heavy shingled broach spire facing the road is continued as a roof over a clock bearing the date of construction, 1904. 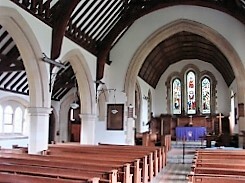 The arcade and moulded chancel arch without abaci are conventional and the roof dominates the interior. It is arched to the collars and lacks the shiny varnish the Victorians would have given it. Repairs were carried out in 1979-80 by A B Carter (ICBS). Font: Octagonal and also displaying the more relaxed attitude to style of the early C20, with classical pilasters in the corners of the bowl. 1. (East window) J Powell and Sons, 1907, designed by — Read (Hadley list). 2. (Five west lancets) J Powell and Sons, 1919, designed by J W Brown (ibid). The vivid colours make up for the conventional drawing. Monument: (South aisle) Andrew Young, the poet. He was vicar from 1941-59. Pulpit: With fluted pilasters between openwork panels, thought to be C18 and probably northern French (BE(E) p629). Reredos: Oak, bearing a religious text and the Commandments. This is unusually late, especially if the date of 1911 in BE(E) (ibid) is correct. My thanks to Gwenda Britt, who drew my attention to the Francis Frith photograph and pointed out its implications for the suggested retention of the old church as chancel of the new one.